At the restaurant where I work, we had to be famous Movie/tv icons. Even though I am female, I've always had a deep spiritual kinship with the character, Kramer, from Seinfeld. 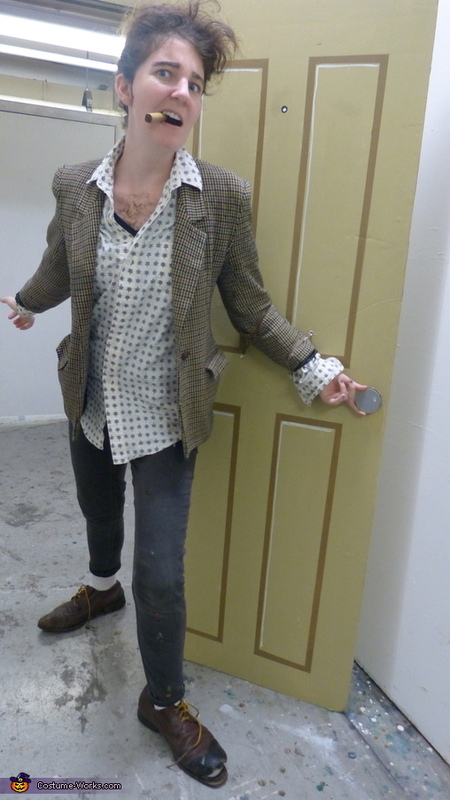 The most iconic Kramer scene in Seinfeld is how he bursts through the door, so I attached a door to my costume and bursted through it. The great part about the door was how I waited tables with it. I'd go up to the table as the door, wait until they were all staring at me (I had a "reverse peephole"), and then surprise them by making a grand Kramer-esque entrance. I'd also fumble, drop pens, accidentally use my cigar as a pen and put the pen and my mouth. I said things like "yadayada," "are those pretzels making you thirsty?" And even though its not his line, if they ordered soup, I'd yell "NO SOUP FOR YOU!" If you want to see a reenactment, go to my facebook - Rives Wiley. Giddy up!